As we were walking around Whole Foods this week looking for new products, we came across a cool looking bag. It has been out for a couple months now, but it was the first time we saw it. 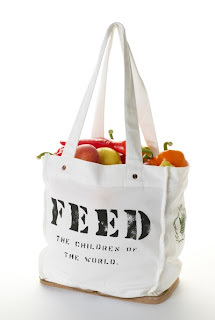 The bag is called the "FEED 100 BAG". The bag is designed solely for Whole Foods Market, the FEED 100 reusable bag is made of organic cotton and natural burlap and is produced with a commitment to ensuring fair treatment of workers, livable wages, overtime pay and safe, clean working environments. Each bag purchased provides 100 nutritious meals to hungry school age children in Rwanda through the United Nation World Food Program’s School Feeding Program. In 1994, Rwanda lost 800,000 men, women and children to genocide; as a result, the nation’s economy and social structures were decimated. School feeding is one of the most effective solutions to stopping hunger and breaking the poverty cycle. Why not support a fantastic cause while buying your favorite organic foods. Pick one up next time your there.